Leh, Ladakh, J&K, India – On the day following his return by road from the Nubra Valley, Sunday, 16th July, His Holiness the Dalai Lama flew by helicopter from Leh to Padam, capital of Zanskar. He was welcomed on arrival by local officials and members of the committee that had organized his visit. 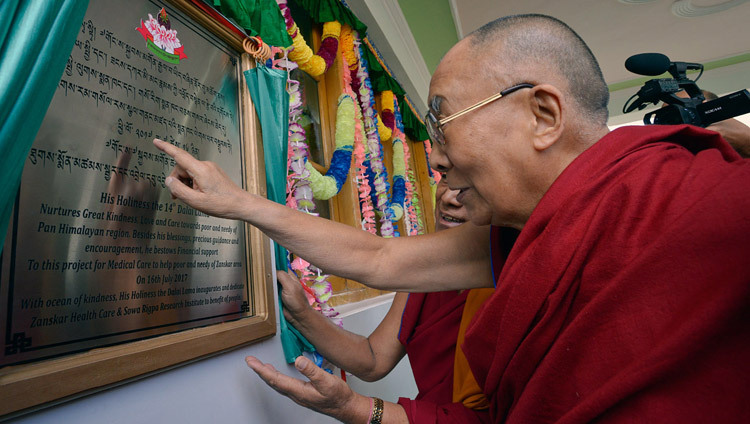 At the Zanskar Health Care & Sowa Rigpa Research Institute, which has received funding support from the Dalai Lama Trust, His Holiness unveiled a plaque marking the Institute’s inauguration and said auspicious prayers. Tea and sweet rice were served. The Chairman, Ven Chosphel Zodpa, introduced the occasion. In addressing the 3000 people in attendance, His Holiness paid tribute to the volunteers from abroad, mostly doctors and nurses from the USA and dentists from Italy, who have been treating the local people. He expressed appreciation of their dedication to providing health care where it was most needed in this remote and under-developed region. Speaking to an estimated 10,000 people who came to attend his teachings on Monday, 17th July, His Holiness again raised the importance of putting effort into cultivating religious harmony. He added that there is also no place in Buddhist practice for discriminating on the basis of caste. He stressed that the Buddha had been clear that caste and family background were of no relevance when it came to upholding the Dharma. When it came to serving tea, efforts were made to ensure that representatives of the whole community took part and that from among those who had previously felt excluded some had the opportunity to serve His Holiness. As part of the empowerment process His Holiness gave the Bodhisattva vows—explaining that it was an opportunity to take them afresh or restore any lapse in observing the precepts. To begin his teachings on Tuesday, 18th July, His Holiness first gave a transmission of the ‘Praise to Manjushri’, known in Tibetan as ‘Gangloma’, to school-children in particular. He told them that in his experience reciting this prayer three times a day as effective in sharpening the mind. In the afternoon, His Holiness was the guest of the Anjuman Moen-Ul-Islam at the local Muslim school. In his remarks His Holiness reiterated the importance of maintaining religious harmony and told his friends that he had also said as much to the Buddhist community. He encouraged both communities to be friendly and to continue to invite each other to their various festivals and celebrations. With a twinkle in his eye, His Holiness told his hosts how much he enjoyed their delicious snacks. This morning, Wednesday, 19th July, His Holiness took off early in a helicopter and flew up the Zanskar and Lingshed Valleys to return to Leh. On arrival he was requested to visit a new cremation facility set up near the airport. In his introduction, the Director of the Central Institute of Tibetan Studies explained that in Ladakh use of cremation facilities is often restricted to residents of the specific localities in which they are set up. Consequently, people from outside occasionally face problems in disposing of their dead. This new facility will be open to Buddhists, whatever their origin, as well as visitors from other parts of India and abroad. The Director mentioned that we are all going to die and the location of this ground prominent in the vicinity of the airport would also serve as a visible reminder of impermanence.